Canada thistle is a 2 to 5 foot tall herbaceous perennial with branched, grooved and slender stems that become covered in hair as the plant grows. The roots are deep and wide spreading horizontal roots which enable vegetative spread by cloning. Alternately occurring lance shaped leaves are green on both sides with a slightly downy undersurface and edges that are deeply lobed with stiff yellowish spines on the leaf margins. The thistle is dioecious, thus all flowers on it are either male or female. Numerous small, compact rose-purple or white flowers appear on the upper stems from June to Sept.-Oct. forming round, umbrella shaped clusters. The seeds are small (3/16 inch or 0.5 cm long), light-brown, smooth and slightly tapered with a tuft of tan hair loosely attached to the tip. Distinguishing Canada thistle from other thistles (Cirsium spp.) can be achieved by noting its unique traits of having deep-running perennial rootstocks, more slender stems, and small compact heads. 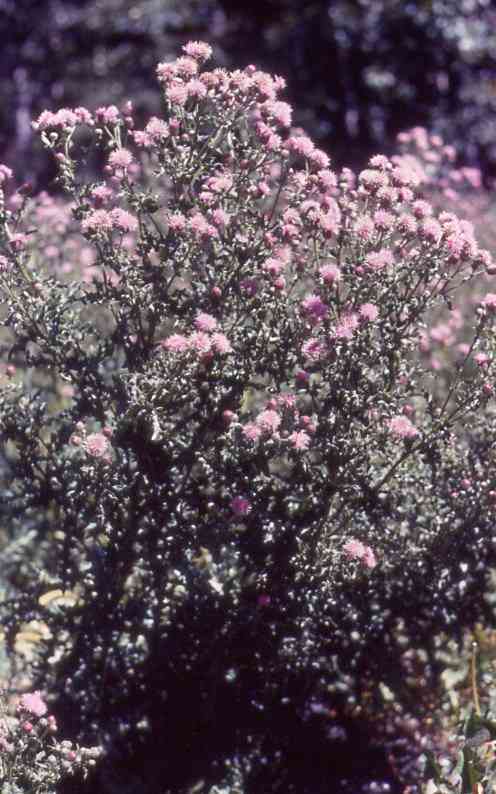 records of its original distribution in its native habitat are unknown. South Africa, New Zealand, Tasmania, and southeastern Australia! Europe and was apparently introduced to North America by colonists in the early 17th century. Cirsium arvense was declared a noxious weed by the state of Vermont in 1795 and by 1918 it was on the noxious weed lists of 25 northern states. By 1991 it had been declared noxious by at least 35 states and 6 Canadian provinces and been introduced throughout the world. Mode(s) of Introduction: Though the original mode of introduction is unknown, the Canada thistle is currently spread through contaminated crop seed, feed, manure, irrigation water and wind. Canada thistle produces an abundance of bristly-plumed seeds which are easily dispersed by the wind. A single plant produces an average of 1500 seeds, and a maximum of up to 5300 seeds in some records! Multiple plants in one area produced an average of 100-64,300 viable seeds/m2 in Australia, and up to 30,200/m2 in Holland. This high fecundity allows the Canada thistle to be reintroduced frequently which is a key component for invasives to become established. Though the mechanism for long distance seed dispersal is not known, irrigation water is another reported possible means of transport. Tillage equipment operated through Canada thistles has been reported to easily spread pieces of roots to non-infested areas and result in new infestations. Reason(s) Why it has Become Established: The Canada thistle does best in disturbed areas such as in overgrazed pastures, old fields, waste places and along fence rows and roadsides. It can also invade sedge meadows and wet prairies from adjacent disturbed sites. The preponderance of disturbed areas in the US provides ample ecologically suitable habitat for the Canada thistle to utilize. Part of success of the thistle may also be due to its physiological advantage of being able to propagate through two methods, by seed and by cloning itself. Introduction to new areas occurs mostly by windborne seed or sometimes by run-off in ditches. From there it then spreads rapidly by rhizomes (root segments). Lateral roots 3 or more feet deep spread from a fibrous taproot which then gives rise to aerial shoots which are sent up at 2 to 6 inch intervals. This allows the thistle to dominate an available habitat and utilize all the available resources in a given area. Seeds can remain viable in soil up to 20 years in some cases, allowing the Canada thistle to wait for favorable conditions and repopulate and area after eradication efforts. Even seeds as old as two years have a 38-71 percent germination rate. It also readily regenerates from root fragments less than an inch in length, allowing it to spread through a freshly tilled agricultural field. Though it regenerates from partially buried and thus still photosynthetically active stems more easily, even fully buried stem parts have been shown to regenerate. Additionally, Cirsium arvense changes morphology in response to environmental conditions and so could be capable of a wide range of adaptation to varying environmental factors. It has also evolved a competitive advantage by producing, and releasing into the soil, toxins that inhibit the growth of certain other plants (e.g. sugarbeets, alfalfa, wheat...). <>Ecological Role: The Canada thistle is capable of crowding out and replacing many native grasses and forbs. It is detrimental to natural areas where it occurs, particularly non-forested communities, and it can change the natural structure and species composition where it becomes well-established. Prairies, barrens, savannas, glades, sand dunes, fields and meadows are susceptible, particularly those sites that have been disturbed and are reverting naturally to native species, as well as those undergoing manipulative restoration management. This highly invasive thistle prevents the coexistence of other plant species through shading, competition for soil resources and possibly through the release of chemical toxins poisonous to other plants. The overall result is a reduction in plant and animal diversity in any natural area it invades through its ability to spread both by seeds and adventitious roots. It also easily hybridizes. In Europe, C. arvense hybridizes with nine other species of Cirsium though it has been found to hybridize with only C. hookerianum Nutt. in North America. The Canada thistle has no natural enemies in its native habitat and relatively few organisms have the potential to act as biological control agents in its nonnative habitats. Most organisms that would prey upon or utilize the Canada thistle are not adequately synchronized with its life cycle to have a large impact or interaction with it. The few species that do interact or harm the thistle include: Orellia ruficauda (a seed head predator), Ceutorhychus litura (a stem-mining weevil) and Vanessa Cardui (larval leaf-feeding Painted Lady Butterfly). In moist areas in Ontario, a synergistic relationship between rust (Puccinia punctiformis) infections and weevil mining occurs, leading to increased impact when the conditions allow for it. Benefit(s): Canada thistles are regarded as a good source of nectar and pollen for honey bees. American Indians purportedly used an infusion of its roots for mouth diseases and considered it to be useful as a tonic, diuretic and astringent and that the young shoots and roots can be used in the same ways as asparagus, and were eaten in Russia and by Native Americans. Due to the ability of Canada thistles to utilize disturbed habitat, it could provide a positive way for society to make use of areas that we have already degraded in the production of honey. Threat(s): Canada Thistles are found in virtually all crops, and are also found in pastures and rangelands where it reduces feed used by grazers. Heavy infestations growing in pasture can reduce native grass production by as much as 60 percent. The prickly mature foliage is thought to reduce productivity of pastures by deterring livestock from grazing and thus threatens both the agricultural and livestock based farming. It also serves as an alternate host for insects and pathogenic microorganisms that attack various crops. In the U.S., it is a host for bean aphid and stalk borer, insects that affect corn and tomatoes and for sod-web worm which damages corn. The weed is an effective competitor for light, moisture, and nutrients and is thus able to substantially reduce crop yields. Heavy infestations of Canada thistles growing in corn, soybeans and wheat have been shown to reduce crop yields by 81, 95, and 60 percent, respectively. A density of 20 Canada thistle shoots per square meter caused estimated yield losses of 34% in barley, 26% in canola, 36% in winter wheat, and 48% in alfalfa seed. Control Level Diagnosis: This species seems to fall under the highest priority of control due to it's fecundity, the availability of habitat suitable for its growth and the success with which it out competes native and agricultural plants. The monetary loss it has already caused as well the increase in the abundance of disturbed ecosystems providing suitable habitat for invasion make it a species that requires serious eradication efforts. <>Control Method: The Canada thistle was among the first 19 weed species selected as targets for biological control when the USDA Rome Laboratory was established in 1959. Years of research has shown that Canada thistles can be controlled best by combining chemical, mechanical and biological methods. Unfortunately, many of the effective methods found are time and labor intensive. For instance, repeated soil cultivation started in May and continued for 2 years at 10 to 15 day intervals during the growing season has been cited as a time intensive but effective method used to starve the plant roots by repeatedly destroying new shoots. A single control method is rarely effective and it is often necessary to use two or more methods at any given site. Also, treatments or combinations that are effective at one site may be ineffective at others. A number of control methods that work on other invasive plants have not worked in the past on Canada thistles. Control methods researched include using herbicides, agricultural methods and mechanical methods. For instance, effective control can be achieved by using several broad-leaved herbicides that do not harm grasses as long as they are timed according to the reproductive cycle for optimal effectiveness. Fire early in the growing season can actually increase sprouting and reproduction so prescribed burns in late spring are considered more effective. Overall, biological control currently provides little or no control of Canada thistle populations, although some agents weaken and kill individual plants. Most potential biological control organisms are not adequately synchronized with Cirsium arvense's life cycle in North America to induce high enough mortality. A possible way to mitigate this is by using management strategies that would delay maturation, such as mowing or burning which may help synchronize the susceptible thistle growth stage to the biocontrol agent life cycle. DIfferent control methods are also required for different levels of invasion and the sites they are invading. Canada thistle should be removed from high quality natural areas when it is first observed since it is very tenacious and difficult to control once established. In lower quality areas, management effort should be influenced by the extent of invasion; greater effort is warranted in areas that have new and/or small invasions which are more likely to be eliminated or contained. Donald, W. W. 1994. The biology of Canada thistle (Cirsium arvense). Reviews of Weed Science 6: 77-101. Nadeau, L. B. and W. H. Vanden Born. 1989. The root system of Canada thistle. Canadian Journal of Plant Science 69: 1199-1206. O’Sullivan, P. A., V. C. Kossatz, G. M. Weiss, and D. A. Dew. 1982. An approach to estimating yield loss of barley due to Canada thistle. Canadian Journal of Plant Science 62: 725-731. O’Sullivan, P. A., G. M. Weiss, and V. C. Kossatz. 1985. Indices of competition for estimating rapeseed yield loss due to Canada thistle. Canadian Journal of Plant Science 65: 145-149. Stachon, W. J. and R. L. Zimdahl. 1980. Allelopathic activity of Canada thistle (Cirsium arvense) in Colorado. Weed Science 28: 83-86. Thomas, R. F., T. J. Tworkoski, R.C. French, and G.R. Leather. 1994. Puccinia punctiformis affects growth and reproduction of Canada thistle (Cirsium arvense). Weed Technology 8: 488-493.